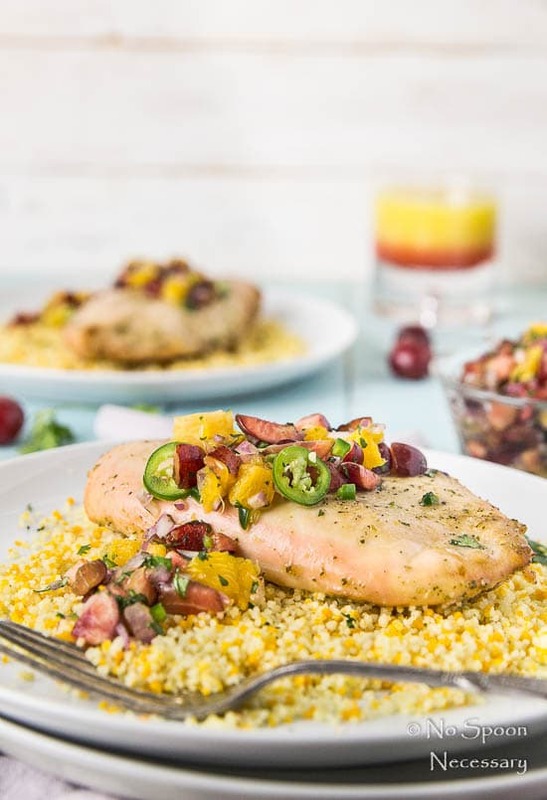 A savory spin on a classic summer cocktail, the Tequila Sunrise, this Chicken with Cherry-Orange Salsa is succulent, sweet and the perfect summer meal! Hello there, friends! How’s it going? Other than that whoops, I’m fine… just sitting over here in the office at the SuBourbon Country Cottage thinking about how there is so much to love about summer. The grilling, flowers, produce, fruit… the general and overall feeling this season brings. With so much to love, it’s a shame summer also has to bring heat and humidity. Is it blazing hot yet where you are? It certainly is hotter than h-e-double-hockey-sticks here in N to the C… but, I’m trying to remind myself not to complain. Since we moved here from FL almost a year ago (<– time flies), I know it could be a lot hotter and the humidity much higher. I think, general speaking, that is something we should all try to remind ourselves from time to time – things can always be worse. I already declared my undying love for all of summer’s fruit, and cherries are one of my favorite. I wish their season was longer though and lasted the entirety of summer. But, since it doesn’t, I knew I absolutely had to bring you a dish that featured cherries while they were still ripe for the picking. 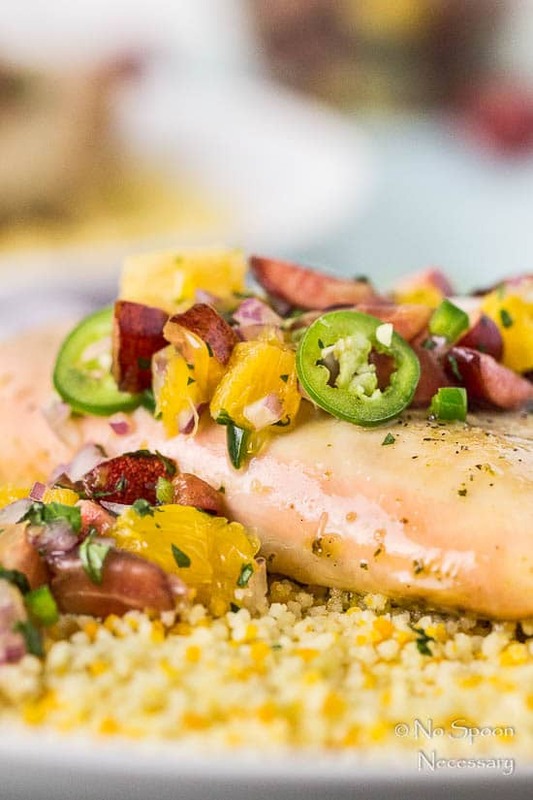 This dish is a savory spin on a classic summer cocktail, the Tequila Sunrise. And this dish also happens to be legitimately delicious, my friends. <– Or is that kind of obvious? 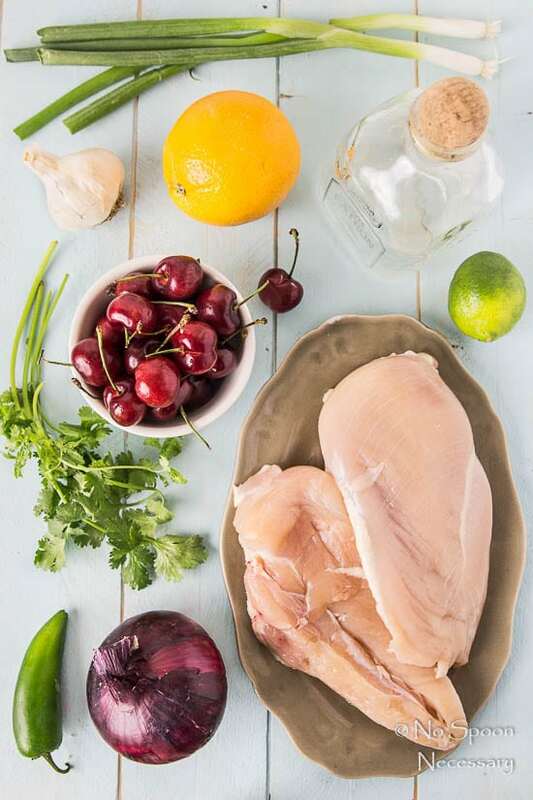 The chicken itself is succulent and tender with notes of citrusy tropical flavors and a hint of tequila. 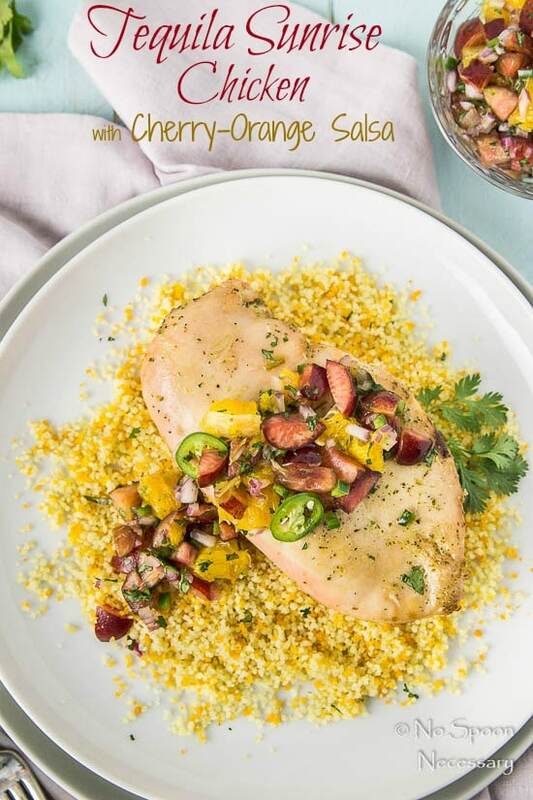 And the cherry-orange salsa is fresh, sweet and tart with a touch of spicy heat. 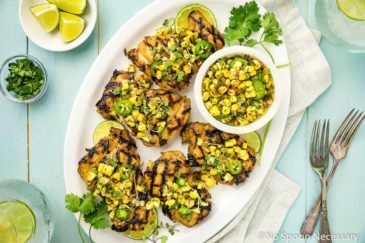 While both the salsa and chicken are absolutely scrumptious on their own, the salsa enhances and mimics the flavors of the marinade used for the chicken and together they really shine. Disclaimer: I had every intention of showcasing this chicken grilled, but I opted to oven bake it for aesthetic purposes. 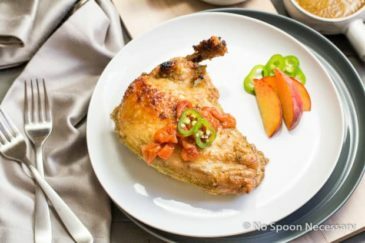 The grill marks on the chicken with the salsa on top didn’t look as photogenic as the baked chicken. I have made this dish both ways, baked and grilled, and both taste delicious. I have included instructions for both methods in the recipe below. The salsa can be made in advance, but as with most things, it tastes best when served the day it is made. 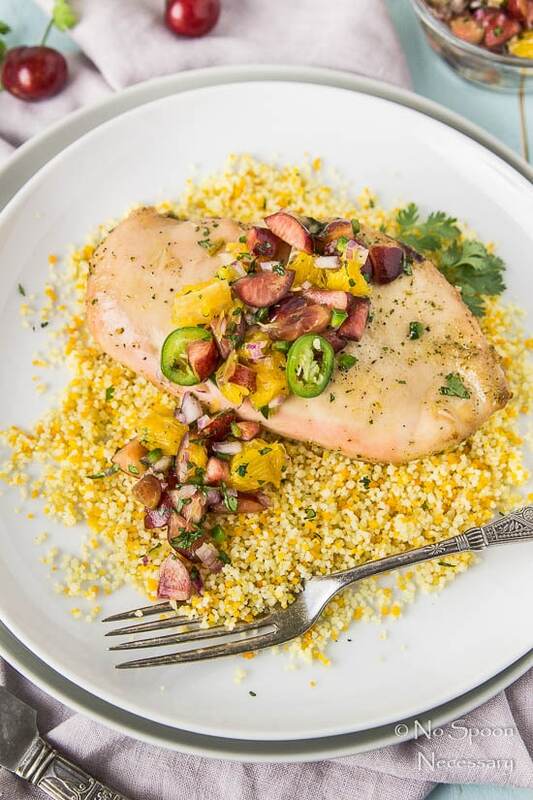 I served this dish with tri-colored couscous, which is pictured. 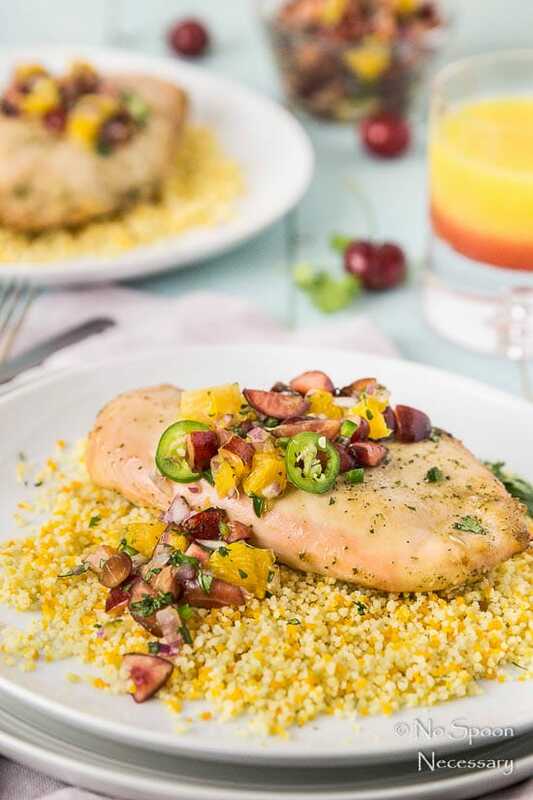 Grilled or oven-baked, this Tequila Sunrise Chicken with Cherry-Orange Salsa is a delicious combination of sweet and savory. 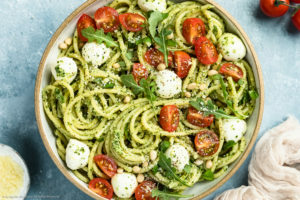 Make this your next summer meal, your taste buds will thank you. Until next week friends, cheers – to a wonderful Father’s Day to all the dads out there! 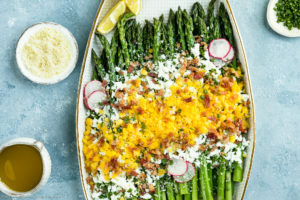 *While I totally think you should make this dish for your dad on Father’s Day, if you want something a little more “manly” I compiled a round-up last year of Dude Approved Food. Check it out here. 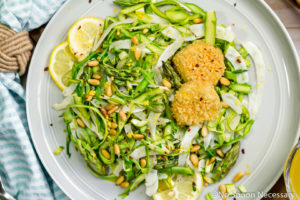 For the Marinade: Place all ingredients, except chicken breast, in the bowl of a food processor or blender. Pulse until combined and well blended. Transfer marinade to a Ziploc bag and add in chicken. Seal and place in refrigerator overnight, turning often. For the Salsa: Place all ingredients in a large bowl and toss gently to combine. Taste and adjust for seasoning. Mix Glaze: Mix together honey and lime juice in a small bowl. Set aside. 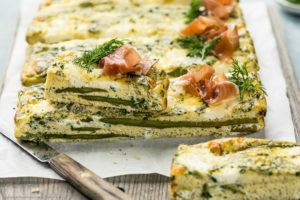 Preheat Oven to 425 degrees F. Spray a large baking dish with nonstick cooking spray. 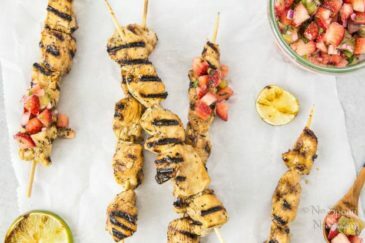 Remove chicken from marinade and discard. Brush chicken lightly with oil and season to taste with salt and pepper. 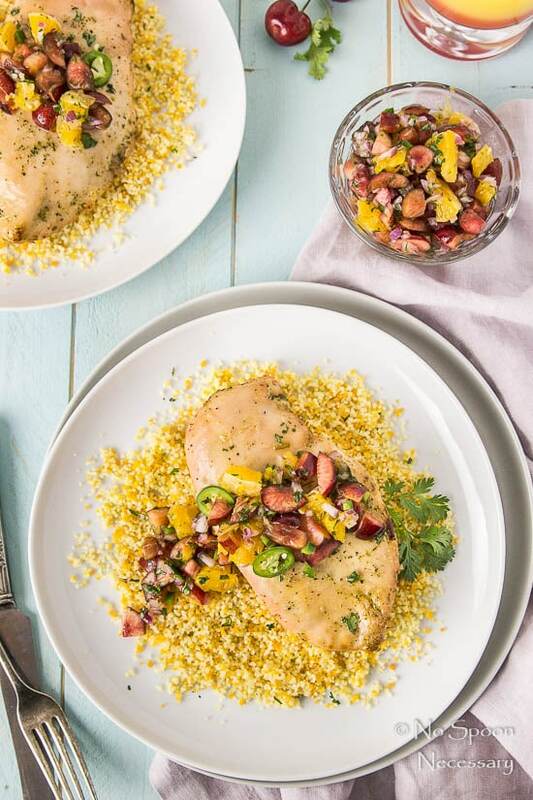 Place chicken breasts in baking dish and bake for 20-25 minutes, or until chicken registers 160 degrees F on an instant read thermometer. Remove chicken from oven and brush with glaze. Let chicken rest for 5-10 minutes. 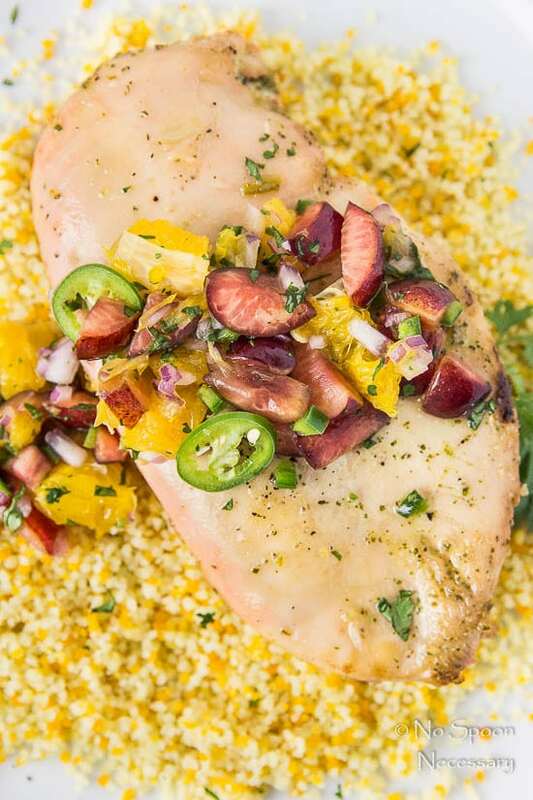 Serve chicken breasts with salsa and enjoy! 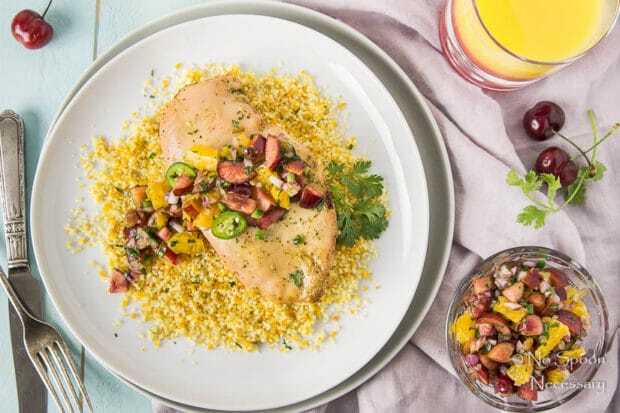 *To pound-out chicken breasts – place chicken breast in a large Ziploc and use a rolling pin or mallet to lightly bash the thicker part of chicken breast to match height of thinnest part. Don’t pound too thin or the chicken breast will end up dry after being cooked. You are looking for about ¾’’ thickness. *For a mild salsa, remove seeds and ribs from jalapeno. *Salsa can be made ahead and stored, covered, in the refrigerator for up to 3 days. 1. Prepare Grill: Light one chimney full of charcoal and arrange on one side of grill. Cover and let grill preheat for at least 5 minutes. Clean and oil grates. For gas grill – set half the burners to medium-high setting. Cover and preheat 10 minutes. 2. 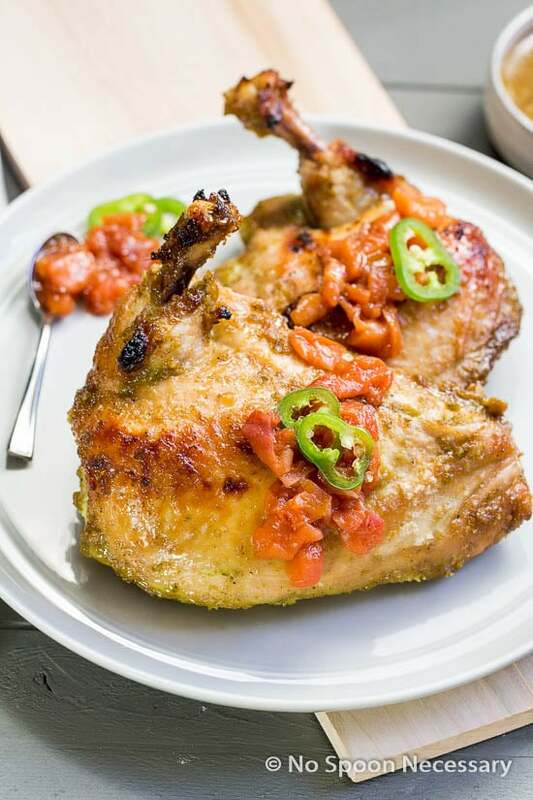 Grill Chicken: Remove chicken from marinade and discard. Brush chicken lightly with oil and season to taste with salt and pepper. Place chicken (skin removed side down) over the hot side of grill and cook until well browned, about 4-5 minutes. 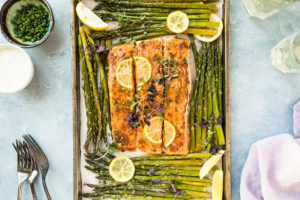 Flip over and continue to cook until chicken registers 160 degrees F on an instant read thermometer, brushing with glaze during last minute of cooking. If second side is browning before it registers 150 degrees, move chicken to cool side of grill, cover and let cook until chicken reaches proper temperature. Remove chicken breasts from grill and let rest for 5-10 minutes. I love a good fruit salsa, but the cherry sealed it for me and then on that grenadine tequila infused chicken. hold me back. Delicious! I can’t wait for the cherries in our garden to ripen, they are still green and tiny, no wonder with the weather we’ve been “enjoying” lately. I would love to have this salsa! 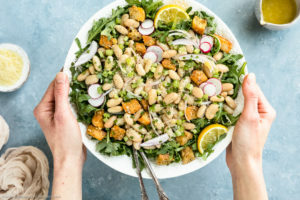 No worries girl, I’ve hit publish before I’ve meant to as well 😉 As with all of your incredible recipes, your combination of flavors always impresses! First of all, tequila…. uh, yeah! 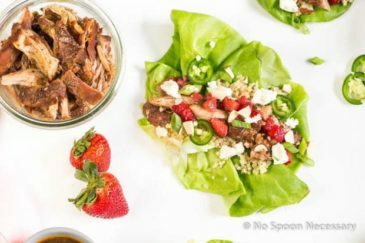 But then I love the citrus marinade, the cherry salsa (I’ve been eating cherries like they’ve been going out of style), and the slices of jalapeno for some heat – totally awesome! I can’t believe I haven’t eaten any summer cherries yet! I keep seeing them at the store and forget to buy them! 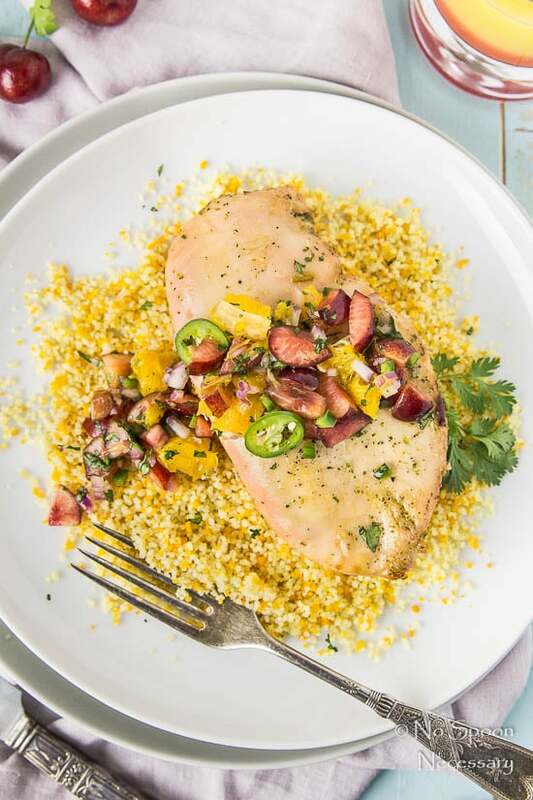 That will be on my to-do list for tomorrow 🙂 I love pairing sweet and savory together and this fruit salsa looks so refreshing on top of that chicken! 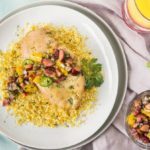 Love that you turned one of my favorite cocktails into a healthy and delicious summer meal. Beautiful pics! Just consider your prepost as a little preview! I did that once and am always worried it will happen again! This chicken looks lovely! 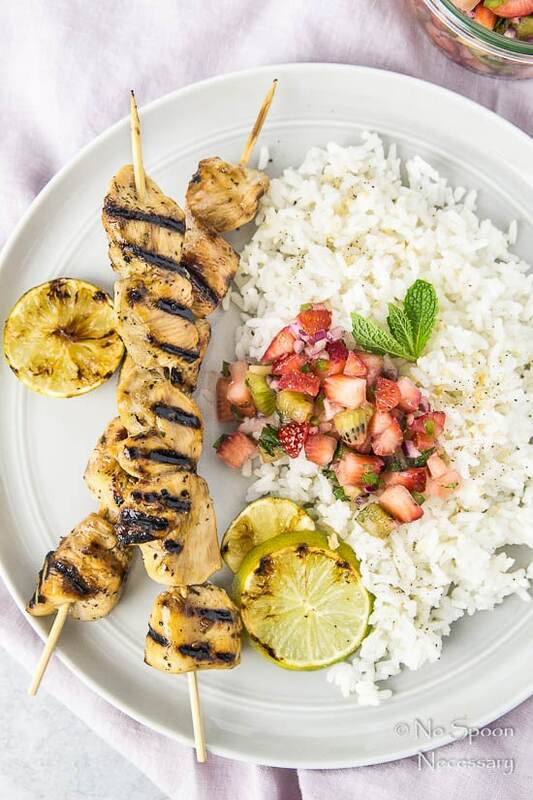 A perfect summer dinner. Hope your weekend has been beautiful! It is flipping hot here! It’s been upper 80s, low 90s for about a week. It’s a little early for Minnesota. I’ve been wearing a lot of maxi dresses. You pretty much had me at tequila sunrise. 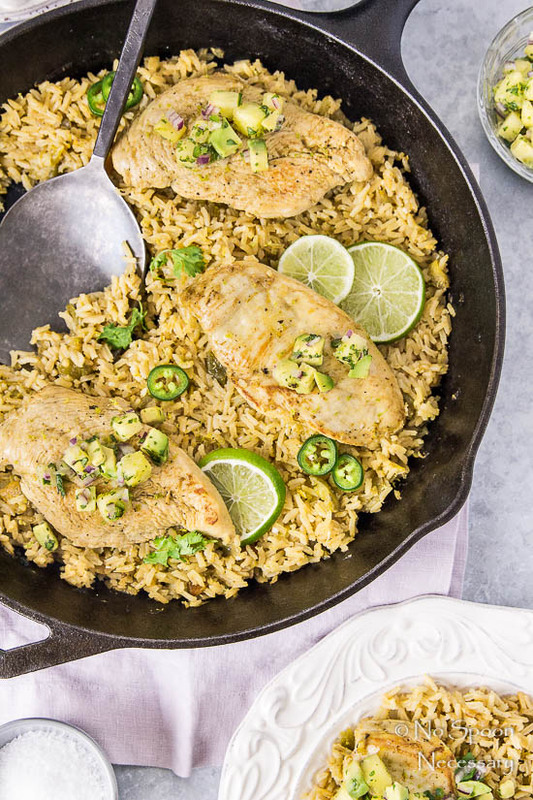 You always have the most rockin’ chicken recipes. That salsa! What an awesome flavor combination. i am on a tequila bender these days! i’ve been using it in all of my marinades and cocktails. it’s definitely my summertime muse. and i’ve been snacking on cherries all day long too. it’s like you were speaking directly to me when i saw this post. this is a MUST make for sure. looks outrageous. PINNED!